We have a rare RCA LP record from the Monkees a famous rock group of 1960's. The members of the group were: Davy Jones, Michael Nesmith, Peter Tork and Mickey Dolenz. Peter Tork and Michael Dolenz. It comes with a Certificate of Authenticity (COA) from MUSICLEGENDS COLLECTABLES in Queensland, Australia. Musiclegends Collectables confirm that the autographs on the above mention item have been personally signed by the celebrity/celebrities mentioned. This was signed during 2002 tour of UK. The record seems to be in great condition and comes with its original paper sleeve. The record cover does show a bit of wear but the LP is over 50 years old and as such is entitled to be a little weary. The name of "Judy" which may be name of a previous owner is handwritten on the back of the album. This is told for accuracy and honesty and does not detract from album. 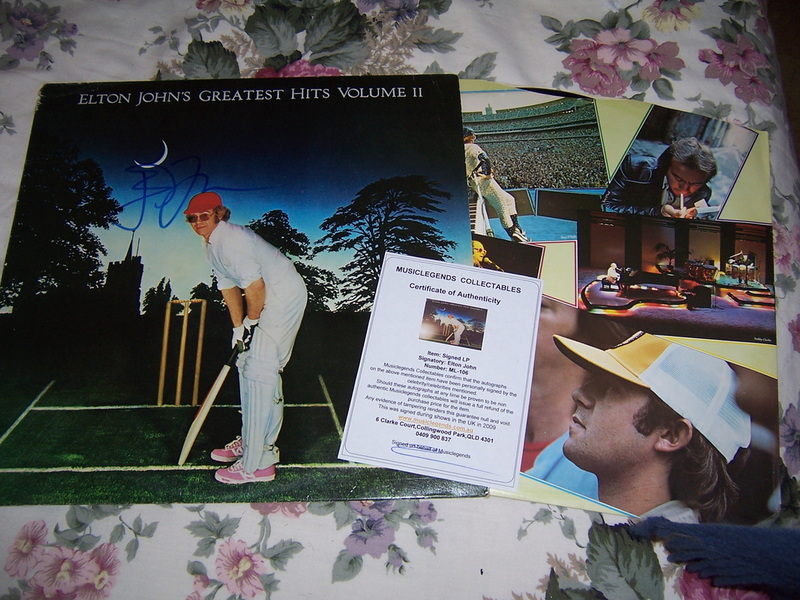 "ELTON JOHN'S GREATEST HITS VOLUME II"
We have an Elton John's LP and record cover which has been personally signed by Elton and comes with a Certificate of Authenticity (COA) from MUSICLEGENDS COLLECTABLES in Queensland, Australia. The record seems to be in great condition except for a scratch on one side and record cover is still very bright in colour. The LP is over 40 years old as it is circa 1970 and is entitled to show some wear.